Wow; things have been quite crazy-busy for me lately... and I'm currently traveling in Germany too, but I noticed this discussion about the world clock and felt the need to chime in a bit. We were in a time crunch when I was originally designing the time applet at Novell, so things are not as polished or as feature complete as intended. (Sorry about that.) There are two major feature differences (and a few minor issues) between what was designed and what was implemented. An way of configuration other than relying on the right-click menu alone. Weather, a (possible) feature pushed forward to "the future, sometime". It's funny that both of these feature improvements are being brought up on the list. I am including a screenshot mockup of one of the earlier designs which shows both of these features. Adjust time changes the clock on a system level. Configure is a quick way to jump to the applet's configuration, which includes editing the location settings (time zone, geo location, and weather, in this case). The screenshot of the calendar does not show the week number (it's useless clutter, relaly). 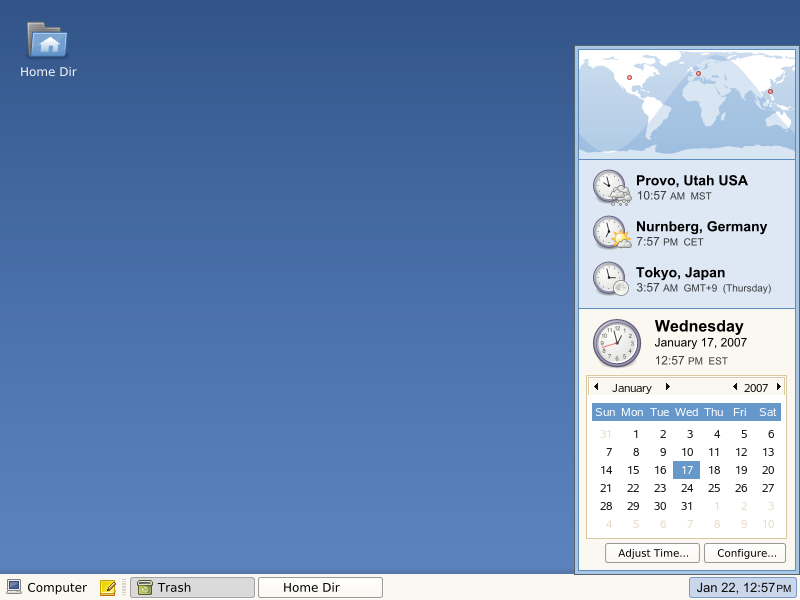 I think the week number is there in the released versoin due to the way the GtkCalendar widget works. Tasks are not accounted for in this mock-up. As an interesting side-note, we did also have a version that changed the clock face based on daylight time (dark it night, light if day), and there were a few other concepts mocked up too. Given the development time frame for the clock applet, what was implemented was pretty amazing. The map with the sunlight was originally something that I mocked up, thinking that it would not be able to be implemented in the the time frame allowed, but Peter Teichman and Mark Gordon both did excellent work to make it a reality. Major kudos to them both. The time zone selector is currently pretty bad. It needs a lot of improvement. We did not have time to implement a brand-new, more friendly UI. This really should be available to other software that needs to deal with time zones too, such as Evolution, and any other time-related software (such as system settings of some sort). Geo-location is also not great. Thankfully, it does provide the location for the city list, so it could be worse (such as not providing a latitude and longitude), but it would be nice to be able to simply click on a map to reposition the marker, or do some placename lookup. Setting the default city (which is flexible and separated from the system time on purpose, for those who travel) needs to be more intuitive. I apologize for this; it was an oversight and was noticed when it was too late to make string changes. Currently one has to double-click to set the default city (and then it becomes bold). Ideally, it would have a nice little button to the side of the list. The configuration window placement is a bit odd. It should show up in the center of the screen and not in the top-left. It's just a very simple bug, but it was not fixed in time. There was a mockup where the location area had an edit link. Since I'm out of town, I don't have immediate access to that mockup, but you can take my word for it. It looked a bit cluttered. We decided that a configure button at the bottom made more sense, and that the configuration dialog would have a page in the tabbed notebook specifically for locations. I hope sharing all this has provided a bit of insight and might help guide the future direction of the applet a bit.